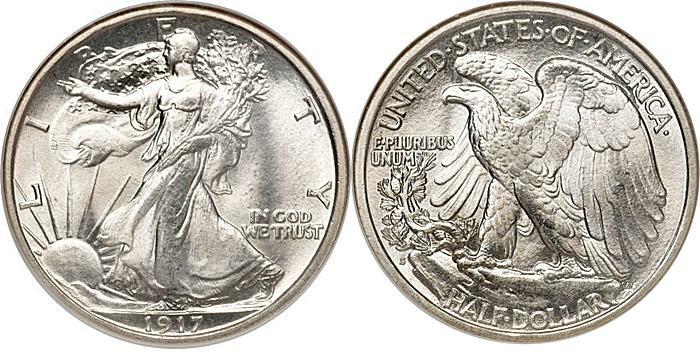 The Walking Liberty Half Dollar design is one of the most celebrated and well recieved designs of all US Coins and the obverse design is still in use on the American Silver Eagle bullion coin. The design is well proportioned, pleasing in intent and a work of art. "For the obverse of his design, Weinman chose a full-length figure of Liberty striding toward the dawn of a new day, clad in the Stars and Stripes and carrying branches of laurel and oak symbolizing civil and military glory. The reverse depicts a majestic eagle perched on a mountain crag, wings unfolded in a pose suggesting power, with a sapling of mountain pine-symbolic of America-springing from a rift in the rock. These strongly patriotic themes resonated perfectly across a nation then preparing to enter World War I, ironically against the land of Weinman's birth. Weinman placed his initials (AW) directly under the eagle's tailfeathers." Coin Information in quotes Provided Courtesy NGC. The series has a large run from 1916 to 1947 and is a large collection to put together with most dates being minted at Denver, San Francisco and Philadelphia Mints and most difficult and expensive to put together as a mint state collection. Price can reach into several hundred dollars for most mint state examples, especially if they're certified by reputable grading services like PCGS, NGC, ANACS or ICG. If you have a keen eye and some time to spend on putting a raw or uncertified collection together than you can still find some mint state bargains but no so much for the key dates. The 1921-D, S, and P (No Mint Mark), and 1938-D should be purchased first since they will increase faster in value than the common dates, and could potentially raise out of your budget allowance. However, you should be careful buying key dates raw unless you know how to authenticate since fakes and counterfeits can be found. After the 1921 dates you should consider purchasing the 1916-S Obverse mint mark and then the other 1916 dates and then 1917 dates and mints since they're semi-keys. In 1916 and 1917 only the mint marks can be found on the reverse (It's located just below the pine branch) on some versions and other versions it's on the obverse (Located below the date). All other dates that have a mint mark the mm is located under the date, and if there's no mint mark then it was minted at the Philadelphia Mint. If you're interested in varieties then the most notable is the 1928-S Large S, 1936-D Doubled Die Obverse (DDO), 1936 DDO, 1939-S DDO, 1941 Proof No AW (no designer initials), 1942 DDR, 1943 DDO, and 1946 Doubled Die Reverse (DDR). Of course there's other minor varieties and the potential for discovering new varieties, but these are the most valuable and well recognized. If you don't know much about Doubled Dies then here' some info Doubled Die Facts and Images. Mint mark location except some 1916 and 1917 dates is on the obverse.